I just have time for a quick summary of today before Tony arrives at 19:00 for us to go out for dinner again. 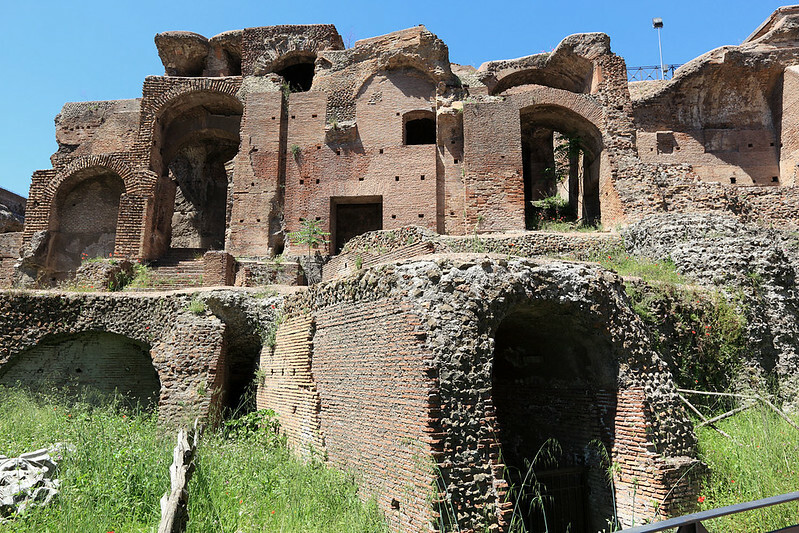 We spent the day checking out the Roman ruins on the Palatino hill, and seeing stuff on leisurely walks there and back. This was the furthest distance we walked from our apartment so far, covering a lot of ground and seeing quite a few incidental things along the way. This morning, however, began with the quest for laundry. I slept in later this morning, to about 07:00, before getting up, having breakfast, and finishing off yesterday's diary. Once M. was up and ready, we went down to check if the garbage room was open and to confirm the location and type of laundry we'd spotted nearby the other day. It was west along Via di Monte Brianzo, and we located it without any trouble. It was a self-service laundromat, which opened at 09:00, still 20 minutes away. We've just had a very nice dinner, but more about that later. After locating the laundromat, we walked back to the supermarket and picked up some more Weetabix and milk, and some apples. On the way home we filled up our water bottles at the fountain on the corner of our street. We packed up our rubbish, separated into organics, plastic, paper, and other, to take it down to the bins in the courtyard next door (as instructed in Signora Cardelli's note). Then we packed our dirty laundry as well and headed out with all of this. We took the garbage into the courtyard and found the bins for it. On the way out, M. spotted Oscar the doorman, a Spanish looking guy with a moustache, and we asked him if he could tell us where a laundry was, thinking maybe he'd know one where we could drop our clothes off rather than have to sit and wait while we washed it ourselves. He said there was one behind the building right across the main street from us, pointing the way. We circumnavigated the building in question, but didn't find any sign of a laundry. We decided to just go to the one we'd found ourselves, but first M. stopped at a bar on the corner for a cappuccino. While she did that, I tried looking around the adjoining buildings to see if I could find the mysterious laundry, but no luck. I picked up M. again and she with said with amazement that the coffee had only cost €1.30, and that she should get it there every day. I said that all the other places she'd been to only charged €1.50, so it wasn't that much difference. She said with astonishment that she hadn't realised they were all that cheap! Thus charged, we went to the laundry, which looked like it had only two washing machines and one dryer. But there was nobody in there but the attendant, who helped us load and start the machine. He showed us the timer that said the wash cycle would take 37 minutes. We'd been prepared to sit in the laundry with my iPad and M.'s book to read, but we decided to go back to the apartment where it was more comfortable, since we had a definite return time and it was only two minute's walk away. We went back at the designated time and the guy again helped us get the dryer started for an initial 20 minutes of drying time. This time we just hung around there to wait. We figured it might need another drying cycle, but when the first one was done, all of the clothes felt dry, so we folded them and put them into a bag the guy gave us. 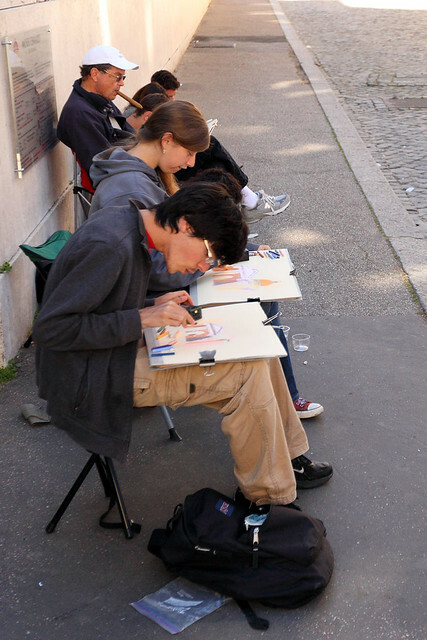 Then we paid him the total cost of €11.50. A complete laundry done in under an hour, brilliant! On the way back we stopped at the bakery, where M. got a chocolate biscotti and four of the nut rolls we'd gotten yesterday. I got a mixed half dozen of what looked like mini pizza rolls with different fillings. Back at home we prepared for our day out, today to go see the Palatine hill and the Roman remains there. We walked south past the Pantheon again and then towards the Vittorio Emanuele II monument. This enormous marble edifice was surrounded by hordes of tourists, who we evaded as we walked around it. The sun was pounding down and we sought any shade there was, but had to walk through full sun a fair distance. Around the monument we emerged on the other side of the Roman Forum to the spot where we'd been the other day and walked along past the Forum of Julius Caesar, which we hadn't seen before on our previous visit to Rome. This route connected the Colosseum to the Forum, and was crawling with masses of tourists and vendors selling snacks, drinks, and cheap souvenirs and doodads. The best strategy was to walk along the Forum side, which overlooked some interesting remains. 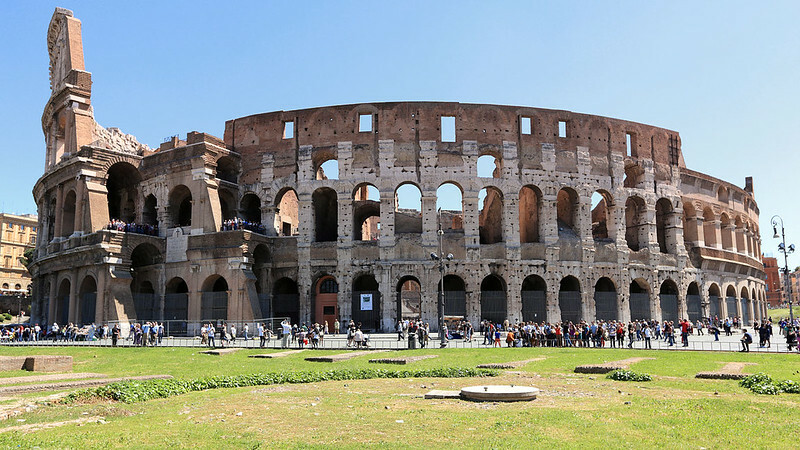 Eventually we arrived at the Piazza di Colosseo, which of course held more tourists, as well as plenty of those suntanned and belligerent faux gladiators who pose for photos for money. We walked down the west side of the Colosseum towards the Arco di Constantine and past that to the entrance to Palatino. There was a queue there, but not spectacularly long, and we joined at the end. The entrance was split into two channels and the queue stretched into the left one only. At some point, someone broke for the beckoning right entry, which triggered a rush of people from the back of the queue to go for that side. Also, a couple of times a huge tour group would arrive and be herded into the right entrance by their guide. As it turned out, when we got close enough to see the small sign, the right entrance was for ticket holders and the left for people needing to buy tickets. Some of the people who had rushed for the vacant right entrance ended up coming back out, disappointed. We steadfastly remained in the left queue and inched our way forwards until it stopped completely just a few steps short of welcome shade. It stalled there for a good ten minutes, while a pair of English couples behind us commented on what was going on. It was amazing that the simple act of buying tickets could take so long. Eventually the queue moved again and soon we were inside buying tickets. A sign indicated that to hire an electronic audio-guide cost €5 and required leaving an ID as a deposit. Maybe that caused the delays. We bought simple entry tickets and moved into the Palatino archaeological site. Once inside, there were lots of people around, but the area was so large that it didn't feel crowded. We walked left up a slope to the remains of some large arched brick structures towering above us that looked like aqueducts. Near these were a collection of what looked like houses, stacked atop each other up the hillside, with brick staircases connecting exposed rooms with arches and windows. Zagging up the hill further, we came to the impressive stadium, which was a long rectangle sunk into the ground below us, about 50×150 metres, with grass and a small bed of flowers at the eastern end. 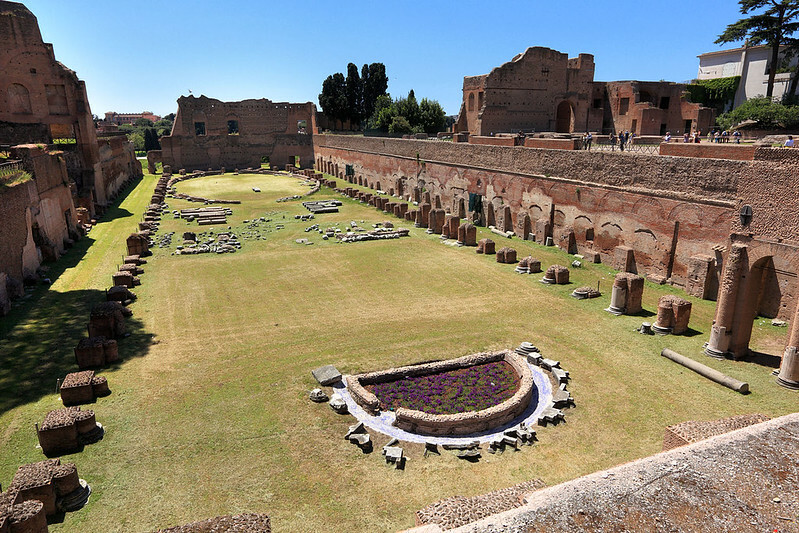 At the other end were stones laid out in a large oval, marking the area for private games held to entertain the Roman Emperors. Moving around the stadium we entered a flat area which contained the remains of several walls, dotted with red poppies, yellow dandelions, and purple thistles. It looked pretty and eerie at the same time, evoking the memories of the Romans who lived here two thousand years ago. The famous pine trees that were scattered about in clumps and lone trees were oddly shaped, so much so that M. didn't recognise them as pines. The lower branches had all been cut off over the years, leaving a single tall trunk topped by a spreading canopy of branches green with needles, so that they only had greenery right near the top. To the left of this area was the Palatine Museum, housed in a relatively modern looking building, about 18th century by my guess. A sign at the entrance said a maximum of 30 people were allowed on each floor at a time and visits were restricted to 20 minutes. But nobody was enforcing any such limits and we wandered in with bunches of other people. It wasn't too crowded, so it was all fine. We went into the basement area first, which held pot shards and similar relics recovered from excavations on the Palatine hill. There was also a glass floored room showing excavations of Roman buildings underneath the floor. 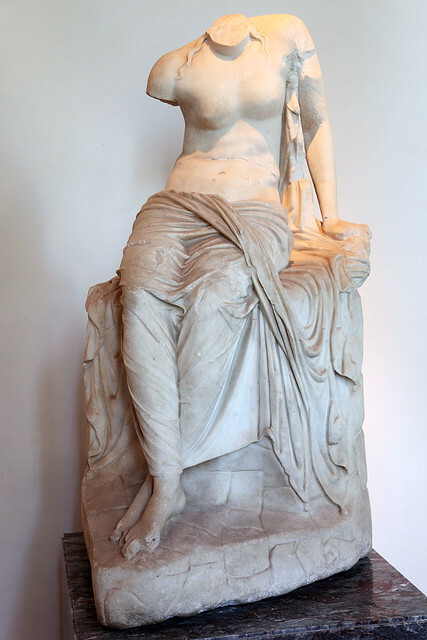 The next floor was up an external set of steps and held lots of marble sculpture similar to what we saw at the Capitoline Museums, busts and full figures, often missing arms and heads. 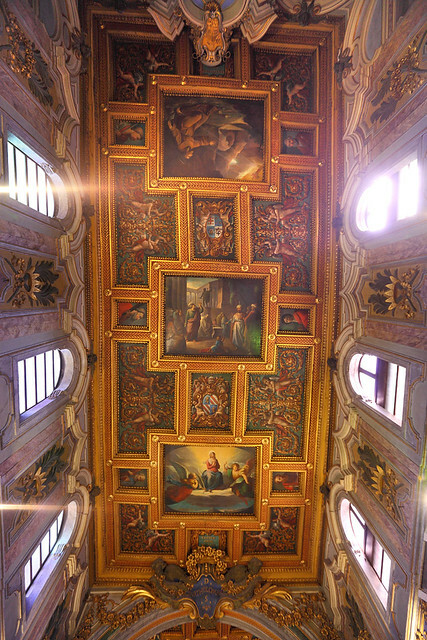 We walked through several rooms of these, including one room with some very well preserved pieces. While admiring these, an American woman poked her nose in to look, then called out to her husband behind her, "It's just more of the same in here!" 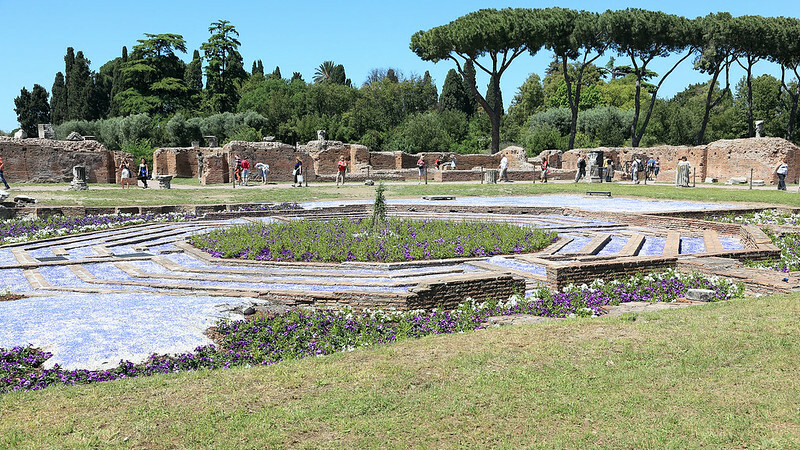 We left the museum and continued along the western side of the Palatine hill, around an impressive formal garden square full of flowers and what looked like areas of crushed blue glass. Beyond this were the houses of the Emperor Augustus and his wife Livia, who had adjacent villas, which the Lonely Planet said were well worth going into. Unfortunately, both of these houses were closed to visitors, with signs and doors locked with heavy padlocks. So we continued up a set of stairs marked with a sign indicating it led to the Orto Botanico, a garden containing several different species of trees and other plants. At the top of the stairs, a gate led to the garden, where dozens of people were wandering around, but the gate was padlocked shut! It was possible to climb over a wall to get into the garden, but we elected to go back all the way almost to the museum building and take a different route, which led us into the garden right near the other side of the locked gate. Dozens of other people had to do the same, for no good reason, as the gate could easily have been open instead of locked shut. Another example of Italian administrative efficiency at its finest. The garden was welcomely shady and had a large terrace overlooking a view to the north, including St Peter's in the distance and some Forum excavations immediately below. Moving around through the garden we came to a rose garden on the eastern side, which gave us views over much of the Roman Forum below. 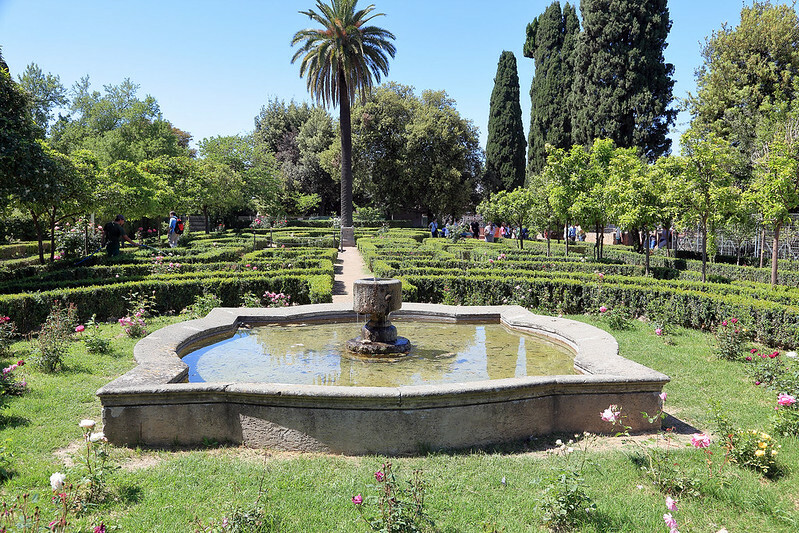 There were dozens of different types of roses in the garden, bounded by hedges, paths, and a fountain or two, making it a very pretty place. From here we started wending our way back to the entrance of the Palatine, through a lovely pine-shaded grassy area where dozens of people were sitting or picnicking. We reached the Criptoportico, the long tunnel connecting the Palatine to Nero's Domus Aurea, where Caligula was murdered. We could only get into a small section of it, and it looked like much of the tunnel was behind a large gate. From here we walked down the eastern side of the ruins we'd seen coming in, including the stadium, until we were at the top of the hill above the entrance gates. Here there was a toilet block and we stopped for a brief rest break before heading down the hill and back out into the street. We turned right rather than go back the way we came, and ended up at the Circus Maximus, which is only a grass jogging track today, with only a single small section of the original Roman building remaining at one end. We walked along the street between the Palatine and the Circus. At the northern end of the Circus was a large white inflatable tent, which we thought may have been an actual circus at the Circus! But when we arrived there, it appeared to be some sort of sport related thing. 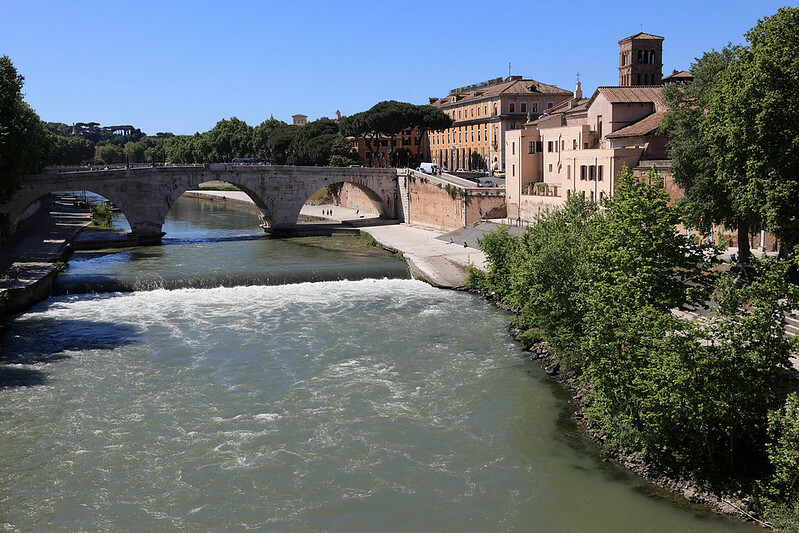 We emerged at the piazza in front of the church with the Bocca de la Verità, and crossed the busy roads there to get to the Ponte Palatino bridge across the Tiber. From here we had a close look at the broken and eroded Ponte Rotto and Isola Tiberina in the middle of the river. Once across the river to the Trastevere side, we walked the short distance to the Ponte Cestio and crossed over to the small island. We looked inside the Chiesa di San Bartolomeo, having a good look at the carved marble well head which sits right in the middle of the steps leading up to the main altar. This is positioned on the site of the original springs reputed to have healing powers, that the church was built around. Looking down into the hole in the marble, we saw a deep hole that fell away further than the light penetrated, presumably all the way down so that it effectively still served as a well. We also noted the 28 Roman era columns from the temple of Asclepius that had originally stood on the same site, and which had been used as supports for the ceiling of the church. There wasn't much else to see on the island, so we headed across the Ponte Fabricio back on to the eastern side of the river, and headed directly inland after crossing the busy road here. 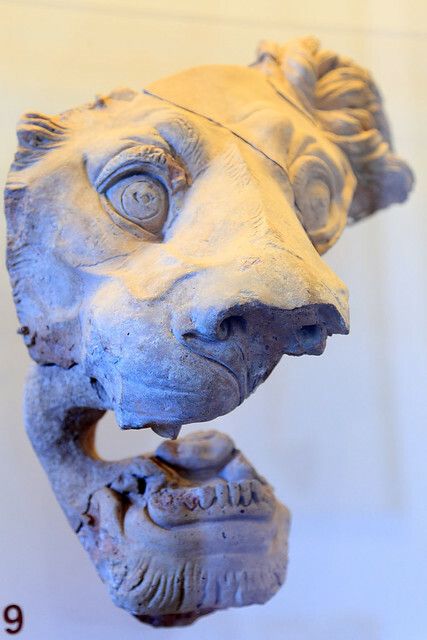 This led us directly to the Portico d'Ottavia, the remains of a large portico or square surrounded by columns, dating from the reign of Augustus. Some of the ruins could be seen below street level, and some of them had been built into modern buildings. There were even blocks of flats with Roman limestone arches at the bottom and modern whitewashed and painted bricks and plaster above! So some people there were living in buildings that were partly two thousand years old. 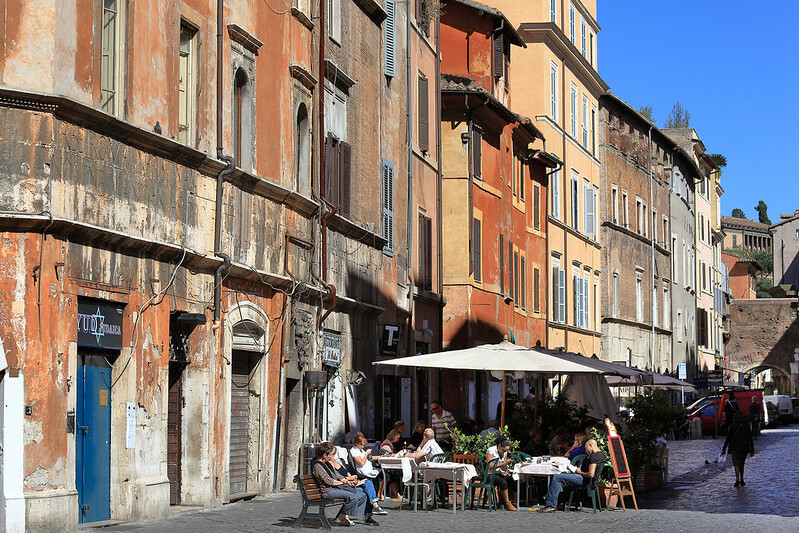 This area was the Jewish ghetto of medieval Rome, and it is still home to synagogues and many restaurants offering Roman Jewish food. We walked past several, and stopped short at one where a large photo of Anthony Bourdain was posted in the window. It boasted how Bourdain liked the restaurant, and there were a few other articles and Michelin stickers and so on in the window. Intrigued, we looked at the menu and discovered that the food looked both interesting and very reasonably priced. So I went in and booked us a table for dinner at 19:30 tomorrow. It's a bit of a walk for us, but should hopefully be worth it. We walked back home from there via Campo di Fiore, where the produce market was packing up for the day, with a street-sweeping vehicle cleaning up piles of vegetable waste and men hosing the square down. The best thing still there was a collection of flower stalls, with many brightly coloured blooms on display. From there it was a walk north through Piazza Navona to our apartment. We rested for a while and showered before dinner. Tony showed up just before 19:00 and we went for a walk over to Via Fratelli to find Enoteca Palatium, which Signora Cardelli had recommended for us, indicating it was a slow food establishment, which Tony said he was interested in trying. Unfortunately when we got there they turned out to be booked out for the evening, so we had to walk around a bit to look for somewhere else. After rejecting a few places as too touristy or limited in menu options, we ended up stumbling across Trattoria Arancio d'Oro. This looked like a very genuine local dining establishment, with no touristy menu. We got a table in the dining room which was empty except for one other table with four Italians on it. I ordered tonarelli cacia e pepe, which is apparently a traditional Roman dish, pasta with cheese and pepper. The waitress, who spoke only a little English, seemed obviously delighted at my choice. M. ordered a pizza with mixed grilled vegetables, but there was some sort of mix up as we asked to confirm it was "just vegetables" and "senza carne", because what came out of the kitchen was just grilled vegetables, with no pizza underneath! Tony got a dish which was small slices of beef or some meat, topped with rocket. He said it was very tender and good. My pasta was excellent, very cheesy and peppery, with the pasta being a thin square spaghetti-like strands, and deep yellow in colour, obviously hand made with lots of eggs. We also got some fried potatoes, which turned out to be thinly sliced and crispy like chips, and an artichoke, stewed Roman style. I liked the artichoke, and had some of M.'s veges while she took some of my pasta. We also shared a half litre of the vino rosso di casa, which was fruity and full bodied. For dessert, Tony had the crostata with house made apricot jam, which he declared excellent. I asked for the torta con ricotta e visciole, a ricotta and wild cherry tart. 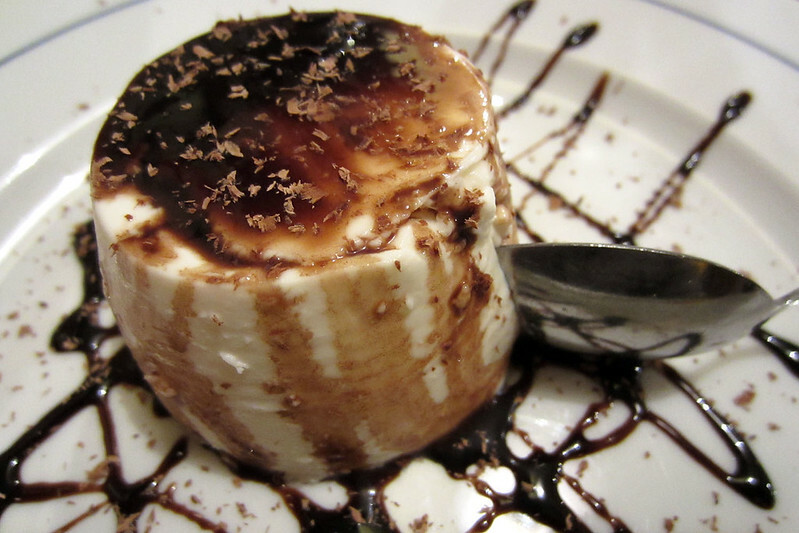 Alas they were out of this excellent sounding dish, so I settled for panna cotta with chocolate sauce, which was very good. Tony had an espresso with his dessert, and M. had another macchiato caldo, which she later declared the best one she's had so far. After dinner we parted company with Tony, arranging to meet again at 19:00 on Monday in our hotel lobby in Venice. He leaves Rome tomorrow, while we head for Venice on Monday. We walked the short distance home and turned in for the night. Last updated: Wednesday, 19 July, 2017; 01:21:01 PDT.